A general view shows the scene of an explosion in Mogadishu, Somalia, Nov. 9, 2018. Three car bomb explosions and gunfire rocked the Somali capital of Mogadishu on Friday, killing at least 23 people in addition to four gunmen, witnesses and health officials said. The blasts, which occurred within minutes of each other, targeted the Sahafi Hotel and its surroundings. The hotel is near the headquarters of the Somali Police Force's Criminal Investigations Department (CID). The head of a local ambulance service tells VOA his company transported 45 wounded people to the hospital. Somali security officials who responded to the attack say four militants entered the hotel and went to the roof, firing on people down below. They said the security forces eventually killed the assailants and rescued dozens of people from hotel rooms. The militant group al-Shabab, which has waged an insurgency for more than 10 years, said it carried out the attack. A witness who was inside the hotel at the time said on condition of anonymity that the front of the building was destroyed by the force of the explosions, which blew out windows. 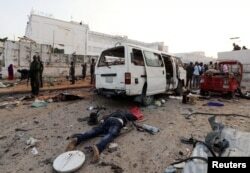 The dead body of an unidentified man is seen at the scene of an explosion in Mogadishu, Somalia, Nov. 9, 2018. Former Somali lawmaker Abdi Barre Jibril said most of the people killed were passersby or passengers in buses or rickshaws. "Two women and an eight-year-old child were among the dead," he told VOA. Other witnesses reported seeing dead people in the hotel back alleys and that those people had been wearing government uniforms.